This past week went very well. We were able to do a lot of fun things. One of them was having my mom, aunt and one sister over for lunch. Ja’Ana made this lovely veggie plate. J and Alissa made potato-cheddar soup, as well. It was very economical and came out extremely tasty. We had a great time together. Our decorations were very simple, but looked pretty. We made the table larger for the occasion, and used the silk flower arrangement I put together last week for a centerpiece. Our dining room is not very big, but it’s doing the job! The girls are making aprons. They worked on them after lunch. Everyone offered advice, and helped them with any rough parts. They are not quite finished, but are making great progress. 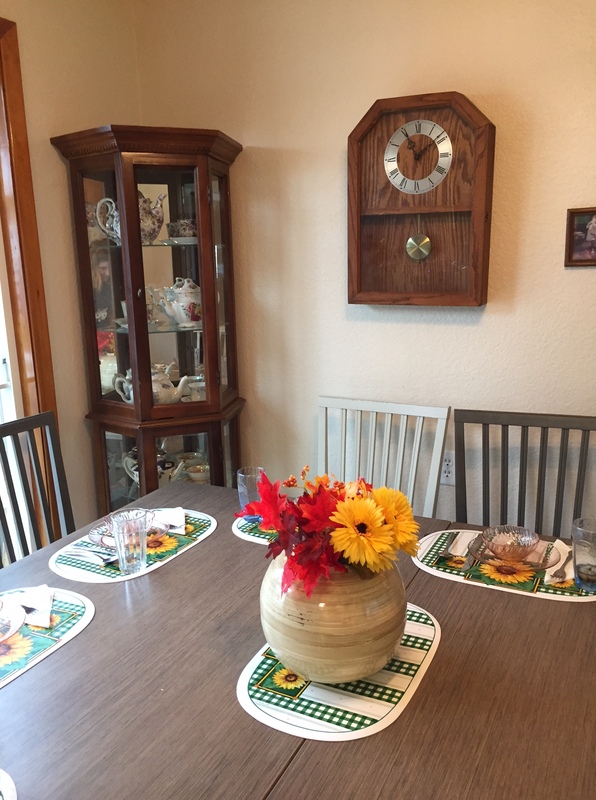 This was a great way for them to get to practice their cooking, table setting and decorating, and then their sewing while enjoying the company of their aunties and grandma. They are cousins who are fortunate enough to share both the aunties and grandma who came this day. Later in the week, we took a trip up the Columbia River Gorge. We were able to take a lunch with us. Of course, we packed lunches all week for both Rob and Patsy to take to school with them. We visited sights that did not cost admission, so our only expenses were gas and a few snacks like ice cream, etc. I was able to do a tiny bit of sewing, but didn’t get very far. I’m trying to make a skirt for Patsy. I’ve run into a bit of trouble. Good thing I already own a seam ripper. I’m getting it out today to fix the issues. I was able to use some fabric I already owned, and a very inexpensive pattern from JoAnn’s. I’m still figuring out how and where to sew in this house. I’m struggling with having enough lighting in the evenings, which is the time when I have time to do anything I want to get done (not helping a kid with anything). On the day my sister was here, we cleaned out the shed behind the shop. We made a better place to stack wood and re-arranged the items that had been stuffed in there when we moved. We worked on stacking wood, and the girls finished that job yesterday. It saves us quite a bit to heat with wood, and this load was chopped at our old house, saved all summer by a friend, and then delivered to us. What a blessing. He needs his trailer back this week, so we were under a time crunch to get it unloaded. 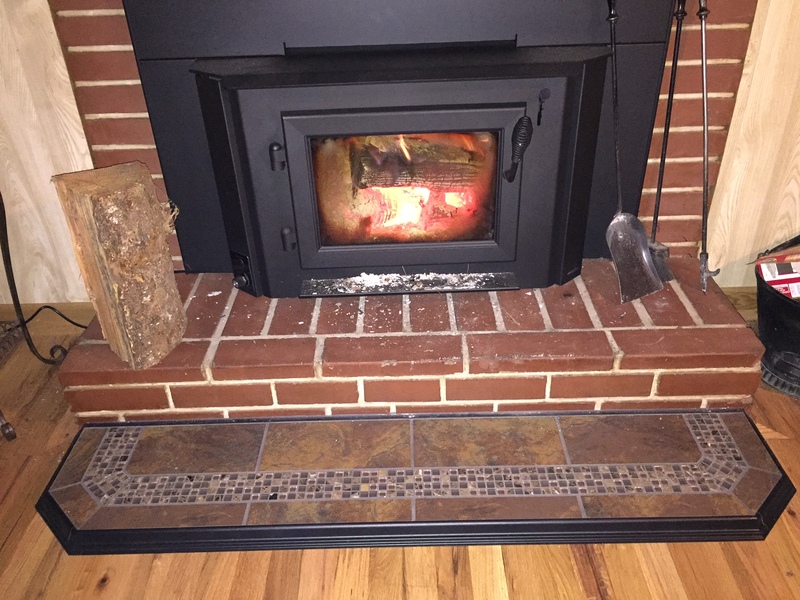 We are loving the new wood stove and hearth we had installed. The fire is so cozy and warm. In fact, we are getting heated out of the house it works so well and are having to open windows sometimes to cool the place down. The weather has been quite mild, so I’m sure this stove will have no trouble keeping us warm when it gets cold. Our next project is rounding up some kindling. We have been working our our shoeboxes for Operation Christmas Child. We found several items on super good sales or around the house, plus some from the Dollar Store to add in. We are not quite done, but will finish this week. 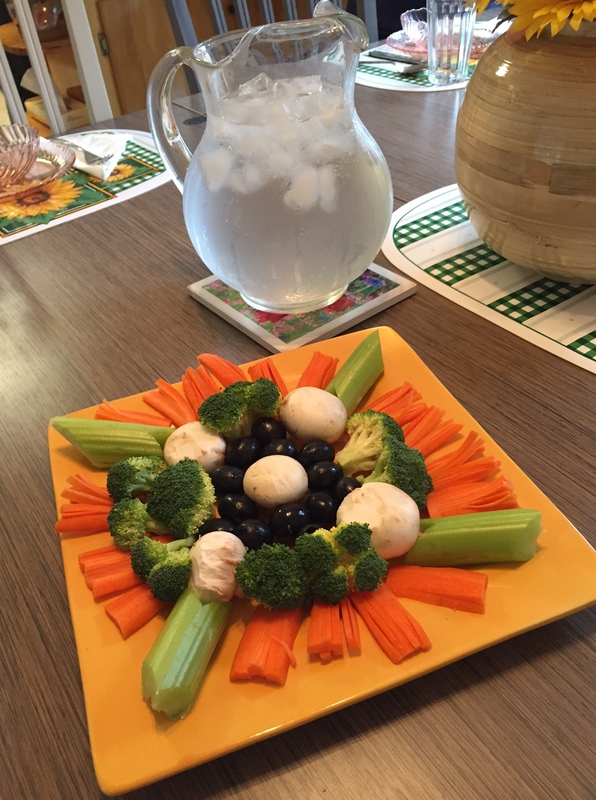 I remember making up veggie platters when I was around Ja’Anna’s age and loved being creative with it. Those girls did a great job cooking and decorating for their guests! I also remember learning various crafts at that age, too. A family friend taught me how to cross-stitch when I was in high school, which eventually lead to me learning how to embroider (self taught). They both look like they are enjoying their lessons in sewing. Excellent job, girls! Love the post. 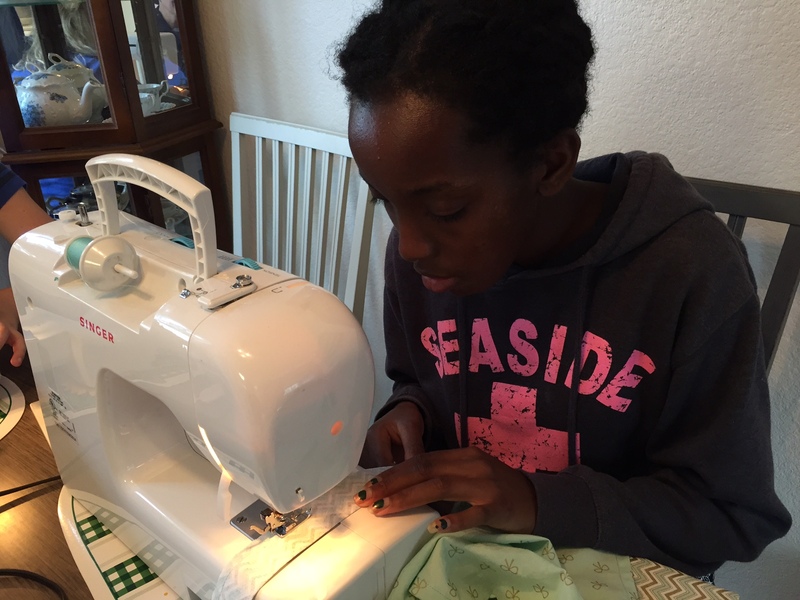 Very nice to see the girls learning to sew. Also, loved your post about your trip on the Columbia. There used to be a state park on the WA side that had white pelicans. Loved going there. I think it’s a county park now. If you ever get to Seattle, one of my favorite free things to do was climb the water tower in Volunteer Park. It had a better view, imo, then the Space Needle. And free. You could see both Lake Union and Lake Washington from that tower. And, did I mention, free? I don’t know if it’s still open or not. Also, the Burke Museum at UW is an awesome natural history museum. I got in free as an employee, don’t know if there’s an admission fee or not for the general public. Do you ever get free admissions for being a homeschool family? Climbing a water tower sounds scary! You are very brave. the water tower has an inside spiral staircase, just fyi.Not scary at all but lots of steps up. 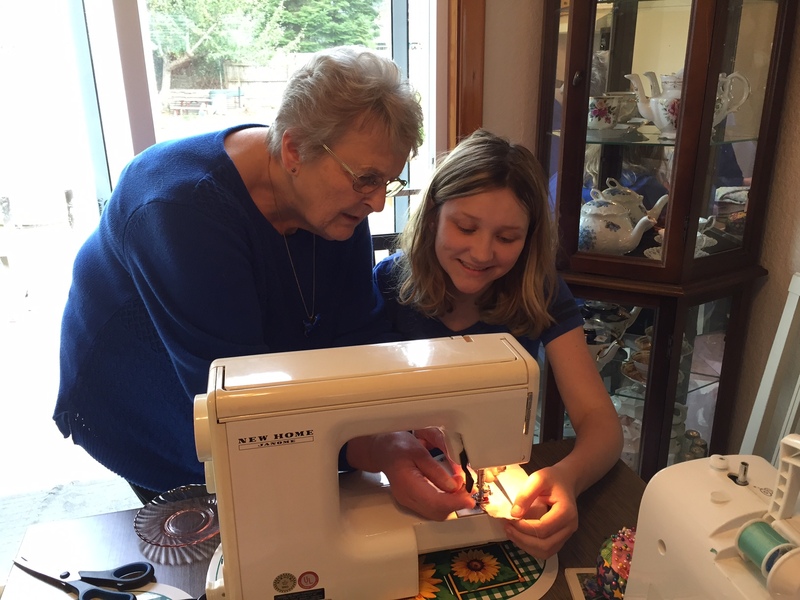 Sewing is so important to learn. So many girls can’t even repair a seam because Home Ec talents have been neglected. So glad the girls are getting some instructions along with the great food they have already been learning to prepare. Go Girls.